It is reasonably assumed that each of the radioactive atoms of a given species from within its nucleus either an alpha particle or a beta particle on disintegration. Hence the count of alpha and beta particles provides the reasonable estimation of disintegration rate. Suppose we follow the emission of alpha or beta particles over a known time interval ∆t (which may be minutes, some hours or even a day). ∆t must be a reasonable time lag but short compared to the half life of radio-element under study. If ∆N is the number of particles recording the counting machine then (∆N )/∆t will approximately represent the rate of disintegration dN/dt. Where N represents the total number of atoms present in sample, at the start of the measurement, can be evaluated from the knowledge of the weight of element and its atomic weight and Avogadro number. This equation used whose half lives vary from some second to some months for the graphical technique. The rate of ejection of particles may be assumed to be proportional to the number N of the radioactive atoms present at that instant. The rate of decay is followed in counting machine. It indicates that there is a certain probability that a particular atom will disintegrates at a given time. The law also shows that the probability is proportional to number of atoms present at that given time. The length of time a radioelement atom can live before it disintegrates may have values from zero to infinity. This explains the gradual decay of radioelement instead of a decay of all the atoms at the same time. The sum of products of the tdN divided by the total number of atoms N_0 will gives the average life of the radioelement. Since the radioactive atoms may be regarded as having an average life, then the product of the fraction of atoms disintegration in unit time that is k and average life must be unity. It is oblivious that a short lived radioelement has small value for its t1/2 and tav, and very high value of decay constant. It should be noted that, however , that a definite fraction k will decay in unit time , although we cannot forecast which particular atom will disintegrate. 1. Since the disintegration obeys the first order rate law, the half life is independent of the amount of the sample. Another way of starting this is rate that the rate (not rate constant k) at which the disintegration occurs is proportional to the amount of the element present. 2. The rate of decay independent of pressure and temperature. It implies that the activation energy of radioactive decay is zero. 3. After n-half times have elapsed the amount of radioactive element remaining will be(1/2)^n. 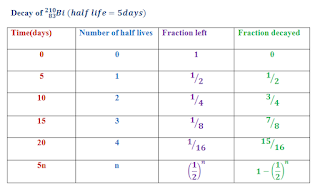 For example, after four half lives only 1/16th of the original element will be left behind. 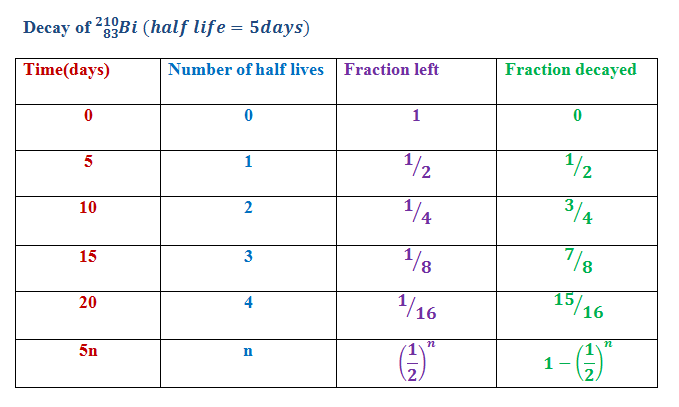 The following table gives an idea as to the fraction of radioactive species of beta emitter remaining a certain number of half life periods.